Merry Free Comic Book Day Eve, comics fans! Yes, the most wonderful time of the year for receiving wonderful free comics is nearly here—in fact, it’s tomorrow, May 5. FCBD 2018 is jam-packed with tons of wonderful (and did we mention, free?) books for you to pick up, so here’s a selection of what’ll be on offer. Don’t forget, while your local comic book shop (which you can find here) will be giving away many of these titles for free, they still purchase them at a small cost from the publishers. So if you can swing it, purchase something while you’re there, too, to support them! 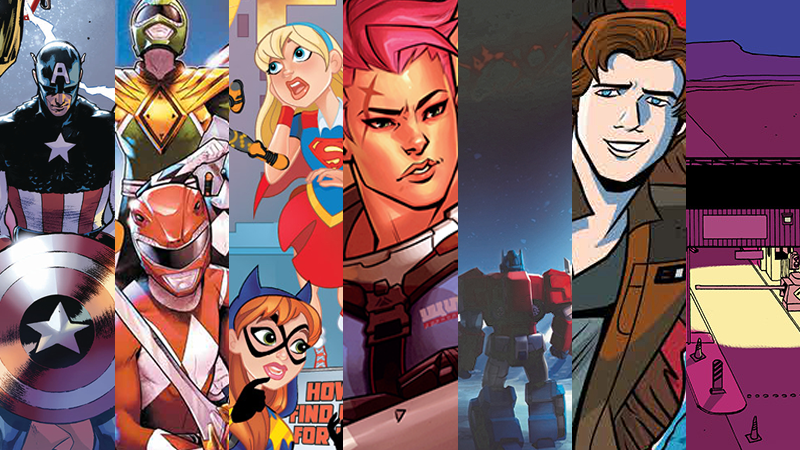 Marvel has not one, but two tastes of what’s on offer this FCBD. The Marvel Comics universe is about to get shaken up again with the arrival of “Fresh Start,” the latest refresh of the publisher’s ongoing roster. You can get a taste of what’s come in three upcoming series in two offerings on Free Comic Book Day. First up is Avengers/Captain America, offering previews of the new runs of each series from new writers Jason Aaron (joined by Sara Pichelli on art for the Avengers tale) and Ta-Nehesi Coates (joined by Leinil Francis Yu for Captain America). Meanwhile, the same deal is going on in a separate issue for Amazing Spider-Man, previewing what’s to come from the incoming team of Nick Spencer and Ryan Ottley. Once again, DC Comics is skipping original content for FCBD, but it’s offering up something for younger audiences (which is a great idea) with a sample from its DC Superhero Girls comics—specifically, the DC Super Hero Girls: A Date With Disaster, which sees Batgirl faced with the toughest scenario she’s ever come up against: her dad, Jim Gordon, going on a date. Oh no! This FCBD, it’s Morphin’ time. Tying into the currently ongoing Shattered Grid event in both of Boom’s ongoing Power Rangers series, this all-new story sees the teens with attitude struggle against the sinister Lord Drakkon, an alternate-reality Tommy Oliver who threatens the very existence of not just the Mighty Morphin’ Rangers, but every Ranger team ever. Cover art for the first issue of Barrier. Image recently announced that it would be bringing Brian K. Vaughan, Marco Martin, and Muntsa Vicente’s gripping scifi tale about immigration in the US to print for the first time, but you can get a taste of what to expect from the series with this extended-size free offering of the first issue. Titan is back with another sampling from its series of Doctor Who comics, including tales from the Tenth, Eleventh, and Twelfth Doctors. But that’s not all: The issue also offers the very tantalizing opportunity to witness the Thirteenth Doctor in action for the first time, in a brief new story from the creative team behind her upcoming comic series. Dark Horse’s big offering for FCBD 2018 offers two reprints of previous comics in one package: first up is a tale from the universe of Blizzard’s hit multiplayer shooter Overwatch, focusing on the Russian soldier Zarya as she is forced to confront her anti-robot prejudices on an important mission. That’s backed up with a sample from the excellent superhero series Black Hammer, which sees a group of classic superheroes suddenly vanish from their city and be forced to reckon with a new life on a farm they can’t escape from. The Autobots are facing the end of everything they’ve ever known. After years and years (and series upon series) of storytelling, IDW is bringing an end to its current universe of Transformers comics. But before that happens, the mother of all Cybertronian threats—the sinister Unicron itself—has come to wreak havoc on the universe, starting in this prequel issue, with the home planet of ROM the space knight in Unicron’s sights. And just so you really know it’s inspired by the show, they put a nice big picture of KJ Apa on the cover. A reprinted sampler from Archie’s ongoing series set in the world of the CW’s Riverdale, this year’s FCBD offering follows four short stories, intertwined through the perspective of Pop Tate himself, as he hears the secrets of his customers coming and going through the Chock’lit Shoppe. When you think of Judge Dredd, you don’t exactly think “all-ages fun,” but that’s what Regened offers. It contains a cavalcade of stories set in the usually rather grim future that instead offers a lighter look at the adventures of Dredd and the citizens that call the Mega-Cities and the wastelands beyond them home. Korra makes some furry friends this FCBD. Dark Horse’s second FCBD offering pairs together two unlikely licensed comics. First up is a new tale with Avatar Korra in a story set after the events of the beloved animated series, as she teams up with young Airbender Meelo on a mission to find pets lost during the chaos that struck Republic City in the series’ finale. The back half of the series offers a look into the world of ARMS, the wacky fighting game for the Nintendo Switch—following the story of Spring Man, who has, well, springs for arms, as he competes to be the best ARMS fighter around. A continuation of Cullen Bunn and Brian Hurtt’s supernatural Western series The Sixth Gun, this first issue picks up after the apocalyptic climax of the previous series, as a new team of adventurers is recruited across the elemental plane that ties together the universe to stand against threats that could doom not just the old West, but all of reality itself. Izuku and the gang are hyped for FCBD! If you’ve never experienced My Hero Academia before—in either its impossibly popular manga or anime incarnations—Viz Media is offering a chance to get in on one of the biggest superhero comic series on the planet, with a sample of its English translation of Kohei Horikoshi’s huge series about superpowered students at a school for heroes-in-training. Also included in the sampler is a backup story set in the world of Rooster Teeth’s anime-inspired science fantasy series RWBY. Star Wars Adventures cover art. IDW’s all-ages focused offering this year takes a trip to the galaxy far, far away with an adventure inspired by the upcoming Solo: A Star Wars Story, as a pre-A New Hope Han Solo and Chewbacca find themselves up against two of the most deadly bounty hunters in the galaxy: 4-LOM and Zuckuss. You can find a full selection of just what comics will be available for Free Comic Book Day 2018 over at the official FCBD website. Happy hunting, everyone, and give a shout out to your local shop in the comments!